3M’s Scotchgard Paint Protection film comes with a 5 year warranty to protect you against bubbling, cracking, or yellowing. While the film has a UV coat to prevent yellowing of the film, it does allow elements of the sun’s light to go through, which means there will be an even fading of your car’s color on areas that are coated compared to areas that are not. The film has a top layer of clear paint that is similar to the finish on your car — which means you can wax and buff right over 3M Scotchgard Paint Protection Film! Other paint protection films can be damaged by waxing and buffing, so treating areas that aren’t coated becomes a difficult and tedious task. 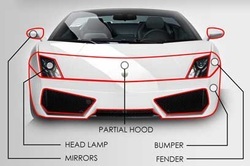 Package A only covers and protects the front bumper, headlights, lower front of hood, partial front fender, door cups, door edges and mirrors. Additional Clear Bra Paint Protection cover can be added upon request such as full hood, full fenders, rocker panels, rear bumper, doors, and/or roof. 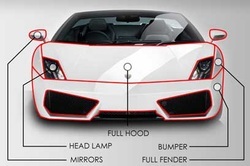 Package B will cover and provide protection for the front bumper, headlights, full hood, full front fenders, door cups, door edges, mirrors, and front grill (if applicable). Additional cover can be added upon request such as rocker panels, rear bumper, doors, and/or roof. 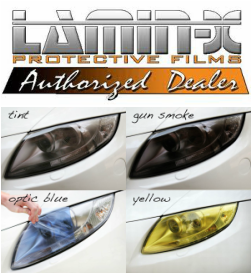 We offer variety of films to cover your headlights and taillights . Add style and functionality, protecting your vehicle from dings, dents, scratches, and other road hazards. Easy and durable installation using 3M double sided tape.